Just Call Me Michael, The Maintenance Man - Hypothetically Speaking . . . Hypothetically Speaking . . .
Ok, I know what you’re thinking. What is Michael getting himself into now? Is he getting his own show on Bravo? Did he finally get that job changing oil at Jiffy Lube? Or, has he finally taking a dive into the fascinating world of male stripping? I can just hear it now. 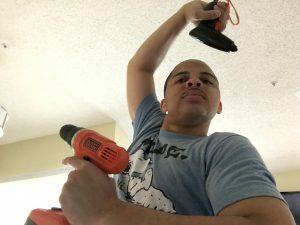 “Coming to the stage in his toolbelt and cowboy boots is Michael, The Maintenance Man. Have your dollars and coins ready.” Well, one can certainly dream. I don’t consider myself to be a handy person. I mean, I have been known to swing a hammer at a thumb tack occasionally, but trust me, no one is calling to put me on the cover of “Popular Mechanics” anytime soon. And if they did, what would I wear? A few well-placed oil stains and a couple wrenches? Hmm, now that I think about it, maybe I could pull that off. No sweat. Actually, sweat would be a good thing in that equation. Yeah, I’d look really handy…and oily. For some odd reason, life has been handing me odd situations where it would have been really helpful to have been born with a screwdriver in one hand and a saw in the other. The first incident occurred when my car lost a headlight. Well, technically, the headlight wasn’t lost. Instead, it decided that, after ten years of service, it’d had enough. It clocked out and went to that little place in the sky where all headlights eventually go. Stranded, I did what any normal person would do when faced with that situation. I called my grandma. I mean, if anyone could teach me how to change a headlight, it would be her. After all, I’ve seen this woman make dinner for 15 people out of a teaspoon of salt and a ketchup packet. Unfortunately, she wasn’t available. She said something about being right in the middle of teaching a CrossFit class and she didn’t appreciate the interruption even if it was an emergency. 1. Get a new bulb. 6. Drain the windshield wiper fluid. Easy. Piece of cake. Even a toddler could do it. So, the next morning, with a fresh, new bulb, I skipped down the sidewalk toward my car. That was when the trouble started. There I was, fully prepared to get to work, but it was the popping of the hood that stumped me. I mean, where was the instruction manual for that sort of thing? Are there buttons? Is there a remote? Can I phone a friend? After breaking a sweat tugging on the hood and giving the car a few swift karate kicks, I took it to the mechanic. They had the lightbulb fixed within a few minutes. Problem solved. A few weeks later, my apartment was renovated. I came home to find my kitchen counter lowered and my fireplace raised, which meant I had to move pictures around and raise the flat screen TV. 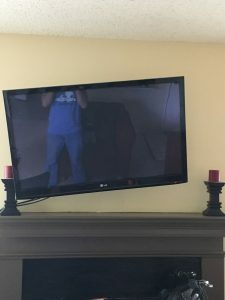 The problem was that the TV was mounted to the wall. Much like the hood of my car, no matter how much tugging, swinging, and pulling on it, it wouldn’t budge. This job would require some elbow grease…and maybe my grandma. Fortunately, I had paid attention when the TV was originally mounted to the wall. Of course, that means I should have known that I couldn’t just move it with a little push or tug. If it took a drill to get it up there, it was certainly going to take more than a running start and prayer to get it down. Regardless, I firmly believed that I could take the TV down and put it back up myself. 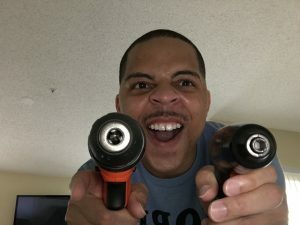 Yes, it seemed like it would be a huge challenge, but my momma always told me that I could do anything I put my mind to—except change a headlight. It wasn’t long before I realized I would need a drill of my own for this endeavor. Immediately, I thought of me drilling a hole into the wall and hitting a powerline or a water main. Knowing my luck, I would probably strike oil. 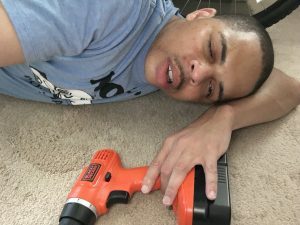 I had visions of me drilling into the wrong piece of wood and having the whole apartment complex collapse right there with me still holding the drill. Can you imagine the headlines? I would be found guilty and sentenced to single handedly having to rebuild the whole complex. That would be a nightmare. Despite my fears, I decided to plunge ahead and get started. If we could put a man on the moon, I could certainly put a TV on the wall. 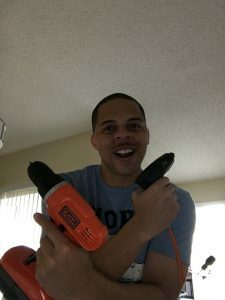 I went to Walmart and found a whole aisle of drills, drivers, sanders and other equipment that I only knew the names of because I’d recently watched The Bone Collector. One wrong move, and a person could easily lose a finger or a head. Losing either would certainly hinder my progress. Eight hours later, after reading reviews and doing comparison, I made my decision. I couldn’t wait to call my dad and tell him I was a drill owner! He cried. Now would be a good time to admit that I may have overdone it with the drill and accessories. 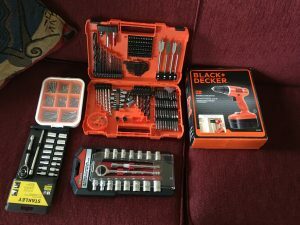 I had no idea what I needed, so I bought everything—including two drills in case one didn’t have enough power. Although the toolkit I purchased had over 70 pieces included, I still purchased more accessories just in case. You just never know when you’re going to lose or break something. I then bought a few socket wrenches and attachments for good measure like any good maintenance man would do. I was serious about my craft. Then came the actual work. Do you know the saying, “measure twice, cut once”? Well, had I used that advice, maybe I would have gotten it right the first time. However, because I didn’t, I found myself mounting and unmounting, mounting and unmounting, and then mounting and unmounting until I got the TV in the perfect position. Fifty drill holes later, it was perfect! The major thing I learned was that it is best to unplug your electronics before attempting to move them around. Not only did the cord hinder my movement in several instances, I also woke up in weird positions on the floor several times with my last memory of seeing a flashing light shooting from the socket. For some reason, my eyebrows appear to have been singed off, and I kept hearing a sizzling sound while smelling something reminiscent of bacon. In any case, I write all of this to say, you, too, can have your very own electronics installed by none other than myself. Prices are completely negotiable, but just know that TV mounting takes no less than 3 weeks and I am paid by the hour. I will accept cash, credit cards, and your first born if they are willing to iron and make my breakfast in the morning. No returns or refunds. For this and more, just call Michael, The Maintenance Man.